3ft. by 5ft. polyester flag with white header and two grommets. Image is screen printed and appears on both sides. Flag of East Prussia. Once part of the Kingdom of Prussia and then the German Empire. Today it is part of modern day Poland and Russia. Ethnic Germans were expelled in mass after WWII. 3'x5' polyester flag with white header and two grommets. Flags have four rows of stitches on the fly and two rows on the top, bottom, and header side. Image is screen printed and appears on both sides. When the Holy Roman Empire was dissolved in 1806, the Duchy of Baden was expanded into the Grand Duchy of Baden. It later became part of the German Empire in 1871. 3'x5' polyester flag with white header and two grommets. Flags have four rows of stitches on the fly and two rows on the top, bottom, and header side. Image is screen printed and appears on both sides. Lower Silesia was part of the Kingdom of Prussia and later the Free State of Prussia. Today part of the region is a principality of Poland. 3'x5' polyester flag with white header and two grommets. Image is screen printed and appears on both sides. A province of Prussia along the Baltic Sea from 1815-1945. Divided between Germany and Poland after WWII. 3'x5' polyester flag with a white header and two grommets. Flags have four rows of stitches on the fly and two rows on the top, bottom, and header side. The image is screen printed and appears on both sides. 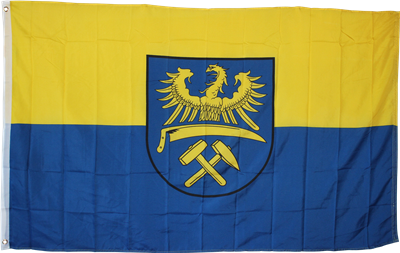 Upper Silesia was annexed by the Kingdom of Prussia in 1745 and became part of the German Empire in 1871. It was given to Poland after WWI.